Built in 1504 by Shimadachi Sadanaga. Class: 12 Extant Original Castles. National Treasure of Japan. Four Best Tenshu of Japan. Matsumoto Castle, formerly called “Fukashi Castle,” was a branch castle of the Ogasawara Family during the Sengoku Period. By that time there was already a marketplace on the east side of the secondary citadel, but the entire west side consisted of swampland, with the full-scale construction of the present structure beginning in the 1580’s. The Ishikawa family, which entered this area as Daimyo in the service of the Toyotomi family, promoted general urban planning, including that for both the castle and the surrounding castle-town. The Tenshu, main tower, is believed to have been built between 1593 and 1594, during the time of Lord Yasunaga, ther second-generation Ishikawa Daimyo. The castle grounds were surrounded byt the triple moat and ramparts, with the inner citadel and secondary citadel as the retrenchment and the tertiary citadel as the outer fortifaction, covering a total area of approximately squire 390,000m. Within the retrenchment were the facilities of the fiefdom and its lord, including the Tenshu, the lord’’s residence and guard of the Load of Matsumoto Castle. An earthen wall was constructed atop the complete 3.5km length of the ramparts, which were surrounded entirely in front by the moat. The only means of entrance into the castle were thourgh mighty gates called Masugata and Umadashi gate. The castle-town was developed along the Zenkkoji Road, which runs from south to north through the town. On the east side of the town is a district of Buddhist temples and Shinto shrines. Many of the streets in the castle-twon have intersections which are L-shaped and T-shaped, with only few crossroads. The residential districts of the samurai and the merchants were separated. The residential district of the samurai classes was divided into two parts by a gate. The inner part was for the homes of the middle-class samurai, and the out part of the homes of the lower class samurai. The merchants’ quarters consisted of three different areas: those made up of three neighborhoods on the main street, ten neighborhoods on the byroads, and 24 narrow alleyways. Each merchant lived in that area which had been set aside for his own social ranking and/or occupation. This is an aerial view of the southern area of the castle-town, as it appears from above the northeastern part of the castle. The sixth floor lies 22.1 meters above the ground and could be covered with 16 pieces of rush-woven “Tatami.” It was designed to be used as the headquarters of the Daimyo, if the castle was under attack. Lowered from the ceiling, the Goddess of Nijuroku-yashin is enshrined. There is a legend connected to the Goddess. On the night of January 26, 1618, in a vision, one of the young vassals on duty saw a woman dressed in beautiful clothes. Handing him a brocade bag, se said “if the lord of the castle enshrines me with 600kg of rice on the 26th night of every month, I will protect the castle from fire and enemy.” It is believed that because the bag was deified the castle was preserved and has survived to be the oldest castle in its original form. The Moon-Viewing Room has openings to the east, north and south. It is connected to the Main Tower on its western side. With a beautiful exterior vermilion balcony and vaulted ceiling, an air of refinement is presented at Moon-Viewing Wing. This openness and refinement reflect the period in which the wing was built, an era of peace following the turbulent age of the warring states. This room was built under the direction of Lord Naomas Matsudaira, a grandson of Tokugawa Ieyasu. 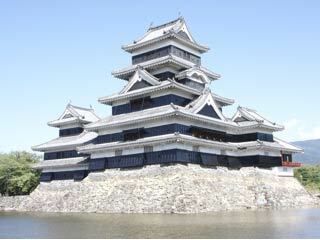 Currently only two castles, Okayama and Matsumoto, have a Moon-Viewing Wing. There are two Gate, Kuro Mon and Taiko Mon, which reconstructed lately. In 1872, following the Meiji Restoration, the site, like many former daimyos' castles, was sold at auction for redevelopment. However, when news broke that the keep was going to be demolished, an influential figure from Matsumoto, Ichikawa Ryozo, along with residents from Matsumoto started a campaign to save the building. Their efforts were rewarded when the tower was acquired by the city government. In the late Meiji period the keep started to lean to one side due to neglect coupled with a structural defect. ( But rumour said that it was because of the curse Tada Kasuke had put on more than two hundred years before with his last breath on the execution pole.) A local high school principal, Kobayashi Y?ya, decided to renovate the castle and appealed for funds. The castle underwent "the great Meiji renovation"(1903-1913) thanks to Kobayashi and others. Half a century later, it underwent another renovation "the great Sh?wa renovation"(1950-1955). In 1990, the Kuromon-Ninomon (second gate of the Black Gate) and sodebei (side wall) were reconstructed. The square drum gate was reconstructed in 1999. There is a plan for restoring the soto-bori(outer moat) which was reclaimed for a residential zone.